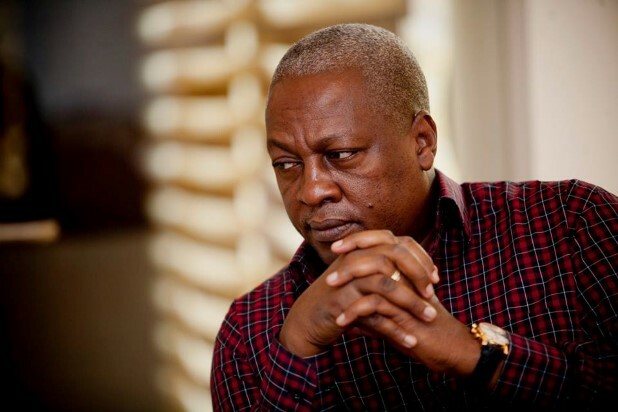 Former President, John Mahama, has been left very surprised and sad regarding Ghana football after his viewing of the yet-to-be-premiered exposé of corruption in politics and football by investigative reporter, Anas Aremeyaw Anas. The tape, titled, “#12”, has been the main topic of discussion in Ghanaian football circles ever since it made the news after portions of it were seen by certain high-profile Ghanaians including the sitting President, Nana Akuffo-Addo, and former Presidents, John Mahama and John Kuffour. For John Mahama, his reaction was put out on Monday in a promo video of the June 6 and seven airing of the exposé. He was seen looking very disturbed at what he knew of the exposé and gave his thoughts on Ghana football. “For many years, we have been wondering why the quality keeps going down. Ghana was one of the greatest teams on the continent and internationally. The contents of the excerpts shown to these personalities led to the arrest and questioning of Ghana Football Association boss, Kwesi Nyantakyi, by the Criminal Investigations Department of the Ghana Police Service. This came after the President watched the tape and ordered his arrest for defrauding on false pretenses. Nyantakyi was subsequently granted bail after the Police conducted a search of his house. The Ghana Football Association released the statement and said that it remained behind Nyantakyi despite the controversy surrounding him and his comments in the Anas tape. The FA added that it would not name an interim head and that its operations would run usually. Observers say that based on the full contents of the Anas tape, the GFA could come under pressure to go for a congress and elect a new member to run its affairs. What have CAF and FIFA said? The Confederation of African Football (CAF), the entity of which Nyantakyi is the 1st Vice-President, is yet to comment on the issue. However, FIFA, the global body in charge of football, has said that it is observing events before determining its next line of action about Kwesi Nyantakyi, who is a member of the FIFA Council, the 24 people who take world football’s most significant decisions. FIFA is closely following this matter and gathering additional information. Please understand we cannot comment further at this stage. No one knows the full contents but if previous exposés are anything to go by, then the tape, which is speculated to last for about 2 hours, will look at revealing personalities involved in various of acts of corruption as stated by Anas Aremeyaw Anas himself.